Courtesy of Larry Sturm, Ripley, WV  "Just a note of appreciation for your prompt service on my fence charger .... The two day turn-around time amazed me, as it just doesn't happen in this day and age. I am very pleased with the repair, for my fence tester now reads 8400 volts. 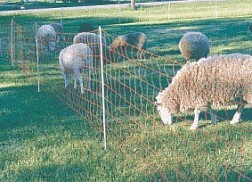 I am paranoid about my fence, because dogs and coyotes would destroy my sheep within a week without it. Thanks again for the super service!" Courtesy of Jim Searcy, Carrollton, Ky  "The reason I do business with you'all is your product and the service." Courtesy of Judith Sanders, Sheep Wrecked Farm, Deerfield, OH  "I've never had an animal get through or over the electric netting in over ten years of use with FAST FENCE." "When I sold the old farm and moved to another, I just packed up the fence and the sheep and took them both with me." Courtesy of Lori Lynne, Star Creek Farm, CA  "We tried out a couple of sections of the Dry Country 42" FAST FENCE Nets (which we had bought for our goats and sheep) to keep our Great Danes in the backyard and WOW !!! It worked great !!! Now we don't have to go "searching" for the dogs. How relaxing." 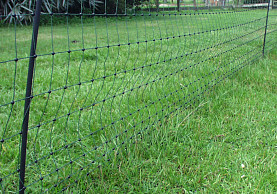 "Please send me two of the FAST FENCE High Security 44" Nets (green & black) as well. Just want to have the less visible green & black fence in the backyard. Such great products, thanks ever so much." Courtesy of Chris Chapman, professional installer, Jefferson, GA  "The MAX-FLEX Superrod Posts are great. We have a big deer problem in Georgia and the Superrod Posts last longer. They don't break easily and they are easier to install than other kinds of posts." Courtesy of Dan Fitzpatrick, Dealer and Professional Installer, Wayland, NY  "The Supertubes are a big improvement over the old wraparound insulators. The guys on my crew really like them because they don't have to line up a metal strip with the post and the longer length fits big end posts better and faster. They cost a lot less, too." 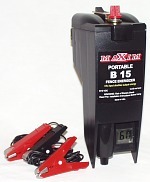 Courtesy of Michael Smalley, Smalley Sanitation, Upperglade, WV  "The B15 Energizer is the best thing there is to keep black bears out of garbage cans. We use two strands of Hot Tape with peanut butter trainers and after the first night, they never come back."